Now I'm not exactly sure what you're asking for here but I'll assume it has something to do with GSDs who work with the military and law enforcement communities that you may have seen on TV, in photos or maybe even in person. So with that in mind, typically, German shepherds who are trained to work in such tense and highly focused jobs are trained just as hard and as long as the police officers and soldiers with whom they work. And there is a very good reason that these communities use German Shepherds in the first place. And why is that? Because German Shepherds are highly intelligent dogs. That's well known everywhere. And the people who work with these animals have to be smart too. In fact, they have to go through a lot of additional training too so that they learn to read the dogs every thought through its body posture and expressions. And concerning biting, that is just one part of a working German Shepherds job, who has a job in the military or in law enforcement. In fact, these dogs are taught when to bite - and even to bite on command - and to release the bite on command too. They don't just bite anything any old time. And that's important to understand because GSDs who have these type of jobs today are taught to be people friendly and only to chase, bite, etc, on command. These dogs are not taught to be indescriminate people biters like the images we have of German Shepherds back during the civl war unrests in the 1960's like so many of us may remember. Working German Shepherds in these type positions today are taught to be good around people and many of them live with their handlers and handlers family (in the case of law enforcement GSDs anyway) too. 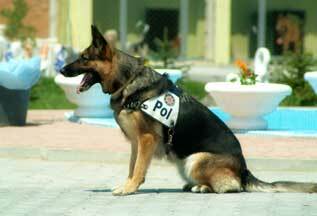 And if you're not familiar with Schutzhund dogs, these dogs also have a protection phase test that is quite well known, and these dogs too are trained when and where to bite. So, anyway, now that I've rattled on for a bit, I guess it is possible that a police officer might get bitten by a fellow German Shepherd officer, but fairly improbable. I think, however, that it would be more possible that a police man or woman gets bitten by someone's untrained pet German Shepherd while working out in the field - just depending on the situation.